Hey, it was the freewheelin’ 70’s! An era of paisley shirts, pet rocks, platform shoes, cowboys and Richard Nixon. 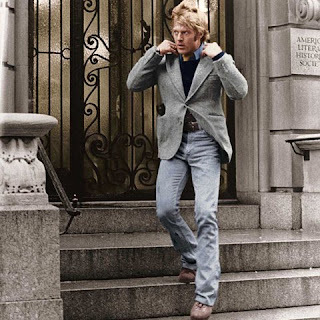 Robert Redford was at the top of his game–in movies like Butch Cassidy and the Sundance Kid, The Sting, The Way we Were, All the President’s Men and The Great Gatsby. He was the fox of the decade. 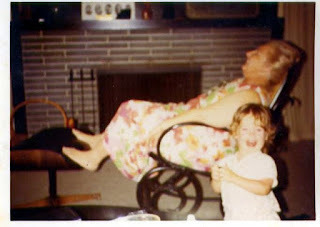 I’m sure that Nana was not immune to his charms. Here we are in 1971. Maybe she’s smiling because she’s thinking about Robert Redford? Probably not, more likely because I was a dorky kid. Who knows what I’m up to here. Anyway, she picked up this recipe somewhere, and I decided it needed to be made. We can’t just let Robert Redford’s namesake dessert be forgotten. Oh, hello cowboy. I can see why they’d name a dessert after you. Ingredients: A 50’s housewife’s dream. The actual recipe calls for instant pudding but I think the cooked kind is better. Use milk and dark rum in it. Mother’s little helper! Now, on to the first layer. Combine the flour, nuts and butter in a bowl. You can use a pastry cutter, or forks or whatever, but I just use my hands. Mix it up until it’s course meal. And press it into the bottom of a Pyrex pan. Then bake it for 15 minutes at 350*. This movie is excellent. It won 4 Oscars in 1976. Layer 2! Cream cheese, powdered sugar and Cool Whip. Yes, Cool Whip. If you want to get all Slow Foods and snobby about it, make whipped cream. But it won’t keep as well. And spread it over the bottom layer. This picture is from The Sting. 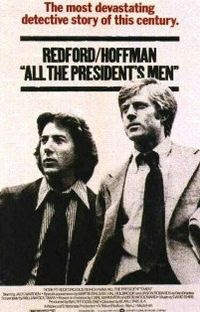 It won 7 Oscars in 1973, and our man was nominated for Best Actor. Layer 3! Remember that rum-spiked chocolate pudding? Here’s where it goes. Spread it out carefully over the cream cheese-Cool Whip layer. Three Days of the Condor. It was only nominated for one Oscar, but Sydney Pollack won a special award that year for directing. Finally, Layer 4! Just Cool Whip. You can use whatever you like, but I used sliced and toasted almonds. This slices best when it’s been refrigerated for a while. If you eat it right away, you won’t be able to see the layers distinctly. It keeps well for a while, and Nana left a note on the card that says it freezes well. 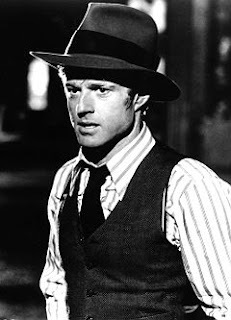 Gals, I saved the best Redford for last. 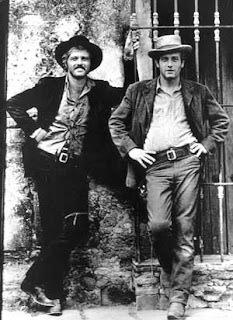 1969’s Butch Cassidy and The Sundance Kid. Won 4 Oscars, nominated for 17. Burt Bacharach took an Oscar for the music, and our guy Robert won a BAFTA for his acting performance. 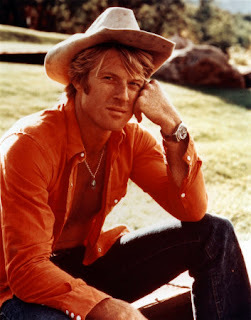 It’s definitely Redford at his foxiest. Good enough to eat, right? I meant the dessert, ladies, the dessert! Mix and pat flour, butter and chopped walnuts (or other nuts) into a 9x13 Pyrex pan. Bake at 350* for 15 minutes and let cool. Mix cream cheese, powdered sugar and 1 container Cool Whip and spread over layer 1. Cook or mix the pudding with the milk and rum. Let cool completely. Top with another container of Cool Whip and sprinkle with chopped nuts. Chill dessert thoroughly. Freezes well. Previous post: Mulvaney’s Fowl Ball! Next post: Give Greens a Chance! Sauteed Kale with Onion, Garlic and Chili.